Canadian-born musician Guy Lombardo was known for his festive approach to New Years' Eve, and his band's performance of eighteenth-century Scots poet Robert Burns's sentimental song Auld Lang Syne quickly became an American tradition. In his heyday, musician Lombardo created a Big Band sound that was characterized by an exaggerated saxophone vibrato, clipped brass phrases, and a unique vocal styling that was the band leader's own. To generations of Americans, the New Year's Eve radio broadcasts by Guy Lombardo and his Royal Canadians playing "Auld Lang Syne" was an annual tradition. Lombardo's New Year's Eve Party eventually set a record as the longest-running annual special produced on radio, and between 1929 and 1952 Lombardo and the Royal Canadians charted at least one hit per year. Although Lombardo died in 1977, his theme song "Auld Lang Syne" continues to be requested by North American audiences ringing in the new year. Gaetano Alberto Lombardo was born on June 19, 1902, in London, Ontario, Canada, to Gaetano and Lena Lombardo. Lombardo senior, who had immigrated to Canada from Italy, worked as a tailor, and the family lived on a small house on Queens Avenue in the town of London. Lomardo was the eldest of seven children—five boys and two girls—born between 1902 and 1924. Lombardo's parents demanded that their children not speak Italian at home, believing that they would be better able to integrate into the English-speaking culture of pre-World War I Canada if they were not burdened with a dependence on the Italian language. Of the Lombardo children, five—Guy, Carmen, Lebert, Victor, and Rose Marie—would establish musical careers. Lombardo once said that his father wanted all his children to have a education in music, and because Guy was the eldest he was given violin lessons. Since the violin player was always the band leader, the young Lombardo was given the role he would continue to play later in life. Lombardo's band got its start in 1914 when brother Carmen, playing flute, joined Guy on violin to perform a duet for the local Mother's Club. Eventually brother Lebert joined the group, along with pianist Freddie Kreitzer. On June 22, 1919, the band was scheduled to play its first professional gig at the Lakeview Casino in Grand Bend. After the club's owner refused to give the band members an hour off for dinner—claiming that his customers paid to hear the band perform, not to watch them eat—Lombardo's father took his sons home and advised them to find another line of work. However, the affair smoothed over and within several months the Lombardo brothers had quit school and were working as full-time musicians. They got no argument on that score from their father, who had always told them that "music is a light load to carry." In the spring of 1923 the Lombardo brothers were hired as the house band for the Hopkins Casino at Port Stanley on Lake Erie. Carmen Lombardo, who was by this time playing the saxophone with a Detroit band, quit so he could rejoin his brothers. After the band started its second season at London, Ontario's Winter Gardens, the 21-year-old Guy decided that the group was wasting its time in Canada. Within a few weeks he obtained the name of a Cleveland, Ohio, booking agent and talked his way into a one-night stand at an Ohio Elk's Club. Meanwhile, he let his friends back in London think he had booked an American vaudeville tour. Following the band's final performance in London, Ontario, on November 24, 1923, the 10-member group was seen off at the train station by about 100 well-wishers. In spite of the lateness of the hour, many were willing to lose sleep to wish the local band good luck. By the time the band returned to Ontario in 1927 as Guy Lombardo and the Royal Canadians, Lombardo was poised for success. In the winter of 1923, as Lombardo drove south to Ohio, the odds that his band would make it big were slim. Fiercely competitive, the U.S. music industry was particularly unforgiving of any new talent that had not established a unique, distinctive sound. Although composed of talented musicians, Lombardo's jazz band did not yet have a sound that set it apart from the competition. Recalling advice from heir father, who had urged his sons to play music that people can "sing, hum, or whistle," the three Lombardo brothers began performing dance music with pronounced melodies but without arrangement or improvisation. The music appealed to the well-to-do audiences of the late 1920s, and reportedly to even a few Prohibition-era gangsters. Although the Lombardo brothers were convinced that, given the competition, they would never succeed by playing beat-heavy, improvisational Dixieland jazz, the other members of the band felt their creative abilities were stifled by switching to dance music. Although they were at first reluctant to go along, the Lombardos won them over. Guy Lombardo was particularly enthusiastic when he discovered that brother Carmen produced a unique tone on the saxophone that blended extremely well with the sound of the band's other two sax players. The result would be money in the bank. Although Lombardo initially had to pay for air time on U.S. radio, it was worth it when the exposure began to attract listeners. After the band began regular live broadcasts its popularity soared. Their agent then came up with the idea of dressing the band members in Canadian Mountie uniforms, but Lombardo balked and countered with a proposal of his own: calling the band the Royal Canadians. By the time Guy Lombardo and the Royal Canadians arrived at the Granada playhouse in Chicago in the fall of 1927, it had ceased to be a London, Ontario, group. From the Granada it went on to land an engagement at the city's Palace Theatre, a gig paying $4,000 a week. The music critic for the Herald & Examiner described the performance as one where he listened to "the sweetest jazzmen on any stage this side of Heaven." In 1929 Lombardo's band made its first appearance at the Roosevelt Hotel in New York City, later to be the home of its live broadcasts on the CBS radio network. The broadcasts eventually moved, originating from New York's Waldorf-Astoria. Although during the band's heyday rumors circulated in Canada regarding hometown concerts by the Royal Canadians, the band made only a handful of appearances in the country where it began. Lombardo never forgot his friends in Ontario, however, and when Canada's Thames River flooded in 1937 he staged a benefit for flood victims in Detroit's Fox Theatre. The band opened this engagement with a rendition of "Home Sweet Home," moving some in the audience to tears. In 1942 youngest sister Rose Marie Lombardo joined the band as a song stylist. A few years later vocalist Kenny Gardner married Elaine Lombardo. Meanwhile Joseph Lombardo, one of the few siblings who had not become a musician, was hired to redecorate New York's Roosevelt Hotel, where the band wintered for 33 years. However, another member of the family made running a family business more than a challenge. Victor Lombardo, the youngest of the musical brothers, constantly provoked fights with Guy and on several occasions he left the Royal Canadians to form his own band. Guy proved long-suffering; he repeatedly took Victor back into the fold after each of the younger Lombardo's failed Big Band ventures. Despite Lombardo's popularity, not everyone was impressed with his music. By the 1950s bobbysoxers were calling the band's music "square." Popular singer Bing Crosby once commented that Lombardo and the Royal Canadians had achieved their continued success with only one single arrangement. Back in London, Ontario, some took to calling Guy "Gooey Lumbago," while others derided Lombardo as the "Schmaltz King," "Prince of Wails," and "King of Corn." Despite perhaps more than their share of derision, Guy Lombardo and the Royal Canadians outlived most of their critics. The band continued to appeal to the large numbers of listeners who appreciated pure melody. Musicians Louis Armstrong, Louis Prima, and Ella Fitzgerald each counted themselves among Lombard's fans, and the band set a record for audience attendance at Harlem's Savoy Ballroom. Between 1929 and 1952 Lombardo's band had a minimum of one hit per year, 21 of which were number-one songs. As late as 2000, the Royal Canadians remained the only dance band in the world to sell more than 100 million records. Although Lombardo became best known for his signature rendition of "Auld Lang Syne" and for "Boo-Hoo," he also scored major hits between 1927 and 1954 with "Charmaine," "Sweethearts on Parade," "You're Driving Me Crazy," "By the River St. Marie," "(There Ought to Be) A Moonlight Saving Time," "Too Many Tears," "Paradise", "We Just Couldn't Say Goodbye," "The Last Round-up," "Stars Fell on Alabama," "What's the Reason (I'm Not Pleasin' You)," "Red Sails in the Sunset," "Lost," "When Did You Leave Heaven?," "September in the Rain," "It Looks like Rain in Cherry Blossom Lane," "So Rare," "Penny Serenade," "The Band Played On," "It's Love-Love-Love," "Managua, Nicaragua," and "The Third Man Theme." There is no accurate count of the number of records Guy Lombardo and the Royal Canadians sold during their career, but estimates run between 100 and 300 million. In addition to his recordings, Lombardo himself appeared in several films, including Many Happy Returns (1934), Stage Door Canteen (1943), and No Leave, No Love (1946). Besides his career as an entertainer, he made a number of successful business investments, and in his after hours he was an avid speedboat racer, holding the title of national champion in the late 1940s. Several generations of Americans heard the strains of Lombardo's "Auld Lang Syne" resonating from New York's Waldorf Astoria. The band's annual New Year's Eve Party became a tradition, setting the record for the longest running annual radio special program. In 1979 the program celebrated its 50th consecutive broadcast, having first appeared on television in 1954. Each year between 1929 and 1952 Lombardo managed to place at least one record on the popular music charts, and 1953 marked the first time in a quarter century years that the Royal Canadians failed to release a best-selling record. Other bad news for Lombardo came the same year, in the form of income tax problems with the Internal Revenue Service. To deal with these dual setbacks, Lombardo signed the band up for more tours, especially back home in Ontario. By 1954, the band's sun had almost set. Their recording of "Young at Heart" climbed to only number 24 on the charts. Rock 'n' roll now drove the North American music industry, eclipsing the music Lombardo specialized in. Despite their waning fame elsewhere, Canada still had a soft spot for the band. In 1955 Guy Lombardo and the Royal Canadians performed at the London, Ontario Centennial, and the centennial organizing committee named a day in the bandleader's honor. During the next 30 years the band made nearly 20 appearances in Ontario, even as the rest of the world was embracing the Rolling Stones and the Beatles. Carmen Lombardo, who created the band's signature sound, died of cancer in 1971. Carmen's death left Lombardo professionally and emotionally shattered, as Guy had been closer to Carmen than to any of his other siblings. In 1974 the Royal Canadians were stung by the first-ever unfavorable review published in their hometown paper. The band made its last appearance in London, Ontario, in June of 1977 at an event where no one on the dance floor appeared to be younger than age fifty. On November 5, 1977, Lombardo died in Houston, Texas, having reached the age of 75. In the years since Lombardo's death "Auld Lang Syne" has remained North America's traditional musical accompaniment to the passing of each year. The last musical Lombardo brother, Victor Lombardo, passed away in 1994. 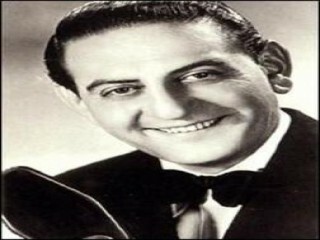 View the full website biography of Guy Lombardo.